Windows 8 Start screen, showing default live tile arrangement. On October 17, 2013, Microsoft released Windows 8.1. It addressed some aspects of Windows 8 that were criticized by reviewers and early adopters and incorporated additional improvements to various aspects of the operating system. Windows 8 was ultimately succeeded by Windows 10 in July 2015. Microsoft stopped providing support and updates for Windows 8 RTM on January 12, 2016, per Microsoft lifecycle policies regarding service packs, Windows 8.1 must be installed to maintain support and receive further updates. Three milestone releases of Windows 8 leaked to the general public. Milestone 1, Build 7850, was leaked on April 12, 2011. It was the first build where the text of a window was written centered instead of aligned to the left. It was also probably the first appearance of the Metro-style font, and its wallpaper had the text shhh... let's not leak our hard work. However, its detailed build number reveals that the build was created on September 22, 2010. The leaked copy was Enterprise edition. The OS still reads as "Windows 7". Milestone 2, Build 7955, was leaked on April 25, 2011. The traditional Blue Screen of Death (BSoD) was replaced by a new black screen, although this was later scrapped. This build introduced a new ribbon in Windows Explorer. Build 7959, with minor changes but the first 64-bit version was leaked on May 1, 2011. The "Windows 7" logo was temporarily replaced with text displaying "Microsoft Confidential". On June 17, 2011, build 7989 64-bit edition was leaked. It introduced a new boot screen featuring the same fish as the default Windows 7 Beta wallpaper, which was later scrapped, and the circling dots as featured in the final (although the final version comes with smaller circling dots throbber). It also had the text Welcome below them, although this was also scrapped. Snap feature: Desktop, along Wikipedia App snapped into a sidebar to the right side of the screen. 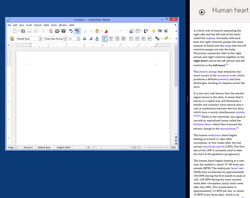 In Windows 8, desktop and everything on it is treated as one Metro-style app. Windows 8 introduces a new style of application, Windows Store apps. According to Microsoft developer Jensen Harris, these apps are to be optimized for touchscreen environments and are more specialized than current desktop applications. Apps can run either in a full-screen mode or be snapped to the side of a screen. Apps can provide toast notifications on screen or animate their tiles on the Start screen with dynamic content. Apps can use "contracts"; a collection of hooks to provide common functionality that can integrate with other apps, including search and sharing. Apps can also provide integration with other services; for example, the People app can connect to a variety of different social networks and services (such as Facebook, Skype, and People service), while the Photos app can aggregate photos from services such as Facebook and Flickr. Exceptions to the restrictions faced by Windows Store apps are given to web browsers. The user's default browser can distribute a Metro-style web browser in the same package as the desktop version, which has access to functionality unavailable to other apps, such as being able to permanently run in the background, use multiple background processes, and use Windows API code instead of WinRT (allowing for code to be re-used with the desktop version, while still taking advantage of features available to Windows Store apps, such as charms). Microsoft advertises this exception privilege "New experience enabled" (formerly "Metro-style enabled"). Windows 8 introduces significant changes to the operating system's user interface, many of which are aimed at improving its experience on tablet computers and other touchscreen devices. The new user interface is based on Microsoft's Metro design language and uses a Start screen similar to that of Windows Phone 7 as the primary means of launching applications. 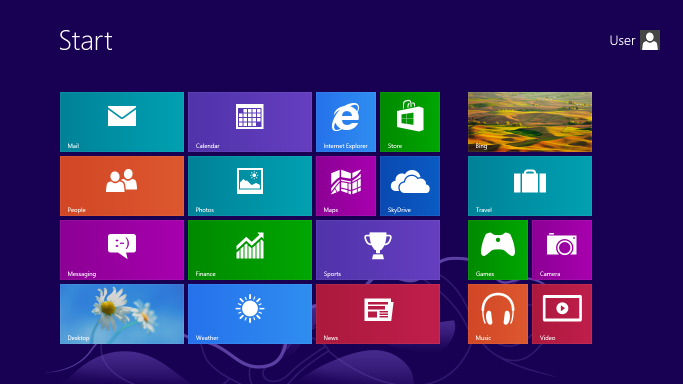 The Start screen displays a customizable array of tiles linking to various apps and desktop programs, some of which can display constantly updated information and content through "live tiles". As a form of multi-tasking, apps can be snapped to the side of a screen. Alongside the traditional Control Panel, a new simplified and touch-optimized settings app known as "PC Settings" is used for basic configuration and user settings. It does not include many of the advanced options still accessible from the normal Control Panel. A vertical toolbar known as the charms (accessed by swiping from the right edge of a touchscreen, swiping from the right edge of a trackpad, or pointing the cursor at hotspots in the right corners of a screen) provides access to system and app-related functions, such as search, sharing, device management, settings, and a Start button. The traditional desktop environment for running desktop applications is accessed via a tile on the Start screen. The Start button on the taskbar from previous versions of Windows has been converted into a hotspot in the lower-left corner of the screen, which displays a large tooltip displaying a thumbnail of the Start screen. However, Windows 8.1 added the start button back to the taskbar after many complaints. Swiping from the left edge of a touchscreen or clicking in the top-left corner of the screen allows one to switch between apps and Desktop. Pointing the cursor in the top-left corner of the screen and moving down reveals a thumbnail list of active apps. Aside from the removal of the Start button and the replacement of the Aero Glass theme with a flatter and solid-colored design, the desktop interface on Windows 8 is similar to that of Windows 7. Microsoft released minimum hardware requirements for tablet and laplet devices to be "certified" for Windows 8 and defined a convertible form factor as a standalone device that combines the PC, display, and rechargeable power source with a mechanically attached keyboard and pointing device in a single chassis. A convertible can be transformed into a tablet where the attached input devices are hidden or removed leaving the display as the only input mechanism. On March 12, 2013, Microsoft amended its certification requirements to only require that screens on tablets have a minimum resolution of 1024×768 (down from the previous 1366×768). The amended requirement is intended to allow "greater design flexibility" for future products. Unlike previous versions of Windows, Windows 8 was distributed at retail in "Upgrade" licenses only, which require an existing version of Windows to install. The "full version software" SKU, which was more expensive but could be installed on computers without an eligible OS or none at all, was discontinued. In lieu of full version, a specialized "System Builder" SKU was introduced. The "System Builder" SKU replaced the original equipment manufacturer (OEM) SKU, which was only allowed to be used on PCs meant for resale but added a "Personal Use License" exemption that officially allowed its purchase and personal use by users on homebuilt computers. Microsoft marketed Windows 8.1 as an "update" rather than as a "service pack", as it had done with such revisions on previous versions of Windows. Nonetheless, Microsoft's support lifecycle policy treats Windows 8.1 similarly to previous Windows service packs: upgrading to 8.1 has been required to maintain access to mainstream support and updates after January 12, 2016. Although Windows 8 RTM is unsupported, Microsoft released an emergency security patch in May 2017 for Windows 8 RTM, as well as other unsupported versions of Windows (including Windows XP and Windows Server 2003), to address a vulnerability that was being leveraged by the WannaCry ransomware attack. Updates to apps published on Windows Store after July 1, 2019 will not be available to Windows 8 RTM users. ^ "Shared Source Initiative". microsoft.com. Microsoft. Retrieved October 28, 2013. ^ "Windows reimagined. #Windows8". Blogging Windows. ^ "Windows 8's delivery date: October 26". ZDNet. CBS Interactive. July 18, 2012. Retrieved September 17, 2012. ^ a b "Windows Reimagined". All Things Digital. Dow Jones & Company. Retrieved October 21, 2012. ^ Foley, Mary Jo (January 8, 2013). "Microsoft: 60 million Windows 8 licenses sold to date". ZDNet. CBS Interactive. Retrieved March 24, 2013. ^ a b Rodgers, Evan (June 26, 2013). "Windows 8.1: a first look at what Microsoft is changing". The Verge. Vox Media. Retrieved August 6, 2013. ^ "Windows 8.1 Support Lifecycle Policy FAQ". support.microsoft.com. Retrieved October 11, 2016. ^ "Steven Sinofsky, Tami Reller, Julie Larson-Green, Antoine Leblond, and Michael Angiulo: Windows 8 Consumer Preview". News Center. Microsoft. February 29, 2012. Archived from the original on February 6, 2013. Retrieved April 27, 2012. ^ "Microsoft confirms ARM support is coming in Windows, will play nice with SoCs too". Engadget. Retrieved May 21, 2013. ^ "CES: Windows to run on ARM chips, says Microsoft". ZDNet. CBS Interactive. Retrieved November 21, 2012. ^ "Microsoft Announces Support of System on a Chip Architectures From Intel, AMD, and ARM for Next Version of Windows". Microsoft. January 5, 2011. Archived from the original on April 7, 2012. Retrieved January 5, 2011. ^ Rosoff, Matt (January 5, 2011). "OK, So Windows 8 Is Coming To ARM Tablets...someday. (MSFT)". San Francisco Chronicle. Hearst Communications. Business Insider. Retrieved January 5, 2011. ^ a b "More on Microsoft 'Jupiter' and what it means for Windows 8". ZDNet. CBS Interactive. Retrieved March 30, 2013. ^ Sams, Brad (April 12, 2012). "Windows 8 Build 7850 has leaked". Neowin. Retrieved December 28, 2012. ^ Asad, Taimur (April 12, 2011). "Windows 8 Build 7850 M1 Has Been Leaked". Redmond Pie. Retrieved December 28, 2012. ^ Kingsley-Hughes, Adrian (April 27, 2012). "Windows 8 build 7955 sporting new 'Black' Screen of Death". ZDNet. CBS Interactive. Retrieved December 28, 2012. ^ Warren, Tom (April 27, 2012). "Windows 8 Milestone 3 build 7989 leaks". Winrumors. Retrieved December 28, 2012. 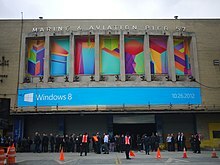 ^ "Live from Microsoft's Windows 8 preview event at Computex 2011". Engadget. AOL. June 1, 2011. Retrieved February 28, 2012. ^ "Previewing 'Windows 8'". Microsoft. June 1, 2011. Archived from the original on March 7, 2012. Retrieved February 28, 2012. ^ Sinofsky, Steven (August 15, 2011). "Welcome to Building Windows 8 Blogs". Microsoft. Retrieved September 8, 2011. ^ "Windows 8 Developer Preview Guide" (PDF). Microsoft. Archived from the original (PDF) on October 7, 2011. Retrieved September 16, 2011. ^ "Home—BUILD". Microsoft. Retrieved February 29, 2012. ^ Albanesius, Chloe (September 13, 2011). "Windows 8 Developer Preview Available Tonight". PC Magazine. Ziff Davis, LLC. Retrieved May 29, 2013. ^ "Microsoft releases Windows 8 Developer Preview, announces Windows Store (update: it's out early!)". The Verge. Retrieved May 29, 2013. ^ Melanson, Donald (September 14, 2011). "Steve Ballmer touts 500,000 Windows 8 downloads in less than 12 hours". Engadget. AOL. Retrieved September 16, 2011. ^ "An update that postpones the expiration date of Windows 8 Developer Preview and Windows 8 Server Developer Preview is available". Microsoft. February 16, 2012. Retrieved May 5, 2012. ^ "Redesigning the Windows Logo". February 17, 2012. Retrieved February 18, 2012. ^ a b "Windows 8: Microsoft unveils consumer preview". BBC. February 29, 2012. Retrieved March 1, 2012. ^ Heater, Brian (March 1, 2012). "Windows 8 Consumer Preview hits one million downloads in a day". Engadget. AOL. Retrieved March 4, 2012. ^ Musil, Steven (April 23, 2012). "Windows 8 'release preview' due in early June". CNET. CBS Interactive. Retrieved June 11, 2012. ^ Warren, Tom (May 29, 2012). "Windows 8 Release Preview leaks out ahead of official debut". The Verge. Retrieved June 11, 2012. ^ Warren, Tom (May 31, 2012). "Windows 8 Release Preview now available to download". The Verge. Vox Media. Retrieved October 27, 2012. ^ LeBlanc, Brandon (May 31, 2012). "The Windows 8 Release Preview & Windows Upgrade Offer". Windows Experience Blog. Microsoft. ^ Warren, Tom (August 1, 2012). "Microsoft completes Windows 8 development, announces release to manufacturing". The Verge. Vox Media. Retrieved August 5, 2012. ^ "Windows 8 has reached the RTM milestone". Microsoft. August 1, 2012. Retrieved August 1, 2012. ^ Reisinger, Don. "Microsoft: Come 'celebrate' Windows 8 on Oct. 25". CNET. CBS Interactive. Retrieved September 17, 2012. ^ Keizer, Gregg (August 3, 2012). "Windows 8 Leaked in Final Form". Computerworld. IDG. Retrieved August 9, 2012. ^ Crothers, Brooke (August 2, 2012). "Windows 8 final version allegedly leaks out already". CNET. Retrieved August 9, 2012. ^ Warren, Tom (August 15, 2012). "Windows 8 now available to download for MSDN and TechNet subscribers". The Verge. Vox Media. Retrieved August 16, 2012. ^ Rose, Stephen (August 16, 2012). "Windows 8 Is Ready For Your Enterprise". Springboard Series Blog. Microsoft. Retrieved August 16, 2012. ^ Stott, Lee (August 18, 2012). "Visual Studio 2012 and Windows on DreamSpark". Microsoft UK Faculty Connection. Microsoft. Retrieved August 24, 2012. ^ Bott, Ed (August 15, 2012). "Surprise! What you can expect from Windows 8 RTM". ZDNet. CBS Interactive. Retrieved August 27, 2012. ^ Cunningham, Andrew. "Post-RTM fixes improve Windows 8's performance and battery life". Ars Technica. Condé Nast Digital. Retrieved October 21, 2012. ^ Thurrott, Paul (October 10, 2012). "Windows 8 App Update: Mail, Calendar, People And Messaging". Paul Thurrott's Supersite for Windows. Penton. Retrieved October 21, 2012. ^ "Microsoft Dives into the Retail Scene". Wall Street Journal. Dow Jones & Company. Retrieved August 22, 2013. ^ "Microsoft recruits Siri to bad-mouth the iPad in new Windows 8 tablet ad". The Verge. Vox Media. Retrieved October 26, 2013. ^ "Microsoft turns Siri against Apple in hilarious new Windows 8 ad". PC World. IDG. Retrieved October 26, 2013. ^ "First Windows 8.1 ad features the return of the Start button". The Verge. Vox Media. Retrieved November 3, 2013. ^ "New Microsoft 'Windows Everywhere' ad crosses product boundaries". ZDNet. CBS Interactive. Retrieved November 3, 2013. ^ Woods, Ben (September 9, 2011). "Windows 8 'hybrid' mode brings faster boot". ZDNet. CBS Interactive. Retrieved January 27, 2012. ^ Thurrott, Paul. "Windows 8 Secrets: Welcome Screen". SuperSite for Windows. Retrieved April 10, 2011. ^ Mackie, Kurt (September 16, 2011). "Windows 8 Will Run on Thumb Drive". Microsoft Certified Professional Magazine. 1105 Media. Retrieved January 27, 2012. ^ Take, First (September 20, 2011). "Windows 8: Windows To Go". ZDNet. CBS Interactive. Archived from the original on October 6, 2011. Retrieved January 27, 2012. ^ "Building robust USB 3.0 support". Microsoft. August 22, 2011. ^ "Microsoft to provide USB 3.0 support for better battery life in Windows 8". ZDNet. CBS Interactive. August 2011. Archived from the original on September 26, 2011. Retrieved October 21, 2012. ^ "Advanced format (4K) disk compatibility update (Windows)". Microsoft. November 28, 2012. Retrieved January 3, 2013. ^ "Windows 8 spurs new touchscreen hybrid PC designs". BBC News Online. BBC. Retrieved October 21, 2012. ^ Paul, Iam. "Microsoft Overhauls Windows Explorer in Windows 8". PC World. IDG. Retrieved February 10, 2012. ^ "Using File History, Windows 8's built-in backup tool". ExtremeTech. Ziff Davis Media. Retrieved September 4, 2012. ^ Amobi, Onuora (April 28, 2011). "Windows 8 drag and drop icons into breadcrumb links". Eye on Windows. Nnigma Inc. Retrieved December 27, 2016. ^ "The Windows 8 Task Manager". Microsoft. October 13, 2011. ^ Kooser, Amanda (September 16, 2011). "Windows 8 Blue Screen of Death gets sad face :(". CNET. CBS Interactive. Retrieved May 15, 2013. ^ O'Brien, Terrence (September 14, 2011). "Windows 8 BSoD ditches confusing error codes for uninformative frowny face". Engadget. AOL. Retrieved May 20, 2012. ^ Goodin, Dan. "Experts: Windows 8 features make account passwords easier to steal". Ars Technica. Condé Nast. Retrieved October 20, 2012. ^ "Windows 8's built-in AV to be security of last resort". ComputerWorld. IDG. Retrieved October 20, 2012. ^ Tung, Liam. "Win8 SmartScreen nudges software sellers to buy code signing certs". CSO. IDG. Retrieved September 12, 2012. ^ "Keeping your family safer with Windows 8". Microsoft. May 14, 2012. Retrieved June 11, 2012. ^ "Windows 8 'Family Safety' feature chaperones underage users through the World Wild Web". Engadget. AOL. May 14, 2012. Retrieved June 11, 2012. ^ "Microsoft: Win8 Simplifies, Improves Parental Monitoring of Kids Computer Activities". PC World. IDG. Retrieved June 11, 2012. ^ "Making the lives of IT easier: Windows 8 Refresh, Reset, and Windows To Go". Ars Technica. Conde Nast. Retrieved October 20, 2012. ^ Shultz, Greg (February 13, 2013). "Create a Recovery Drive in Windows 8". TechRepublic. CBS Interactive. Retrieved April 12, 2013. ^ Mello, John P. (November 10, 2012). "Windows 8 security patches to be released". PC World. IDG. Retrieved November 19, 2012. ^ "Hardware Design and Development for Windows 8". MSDN. Microsoft. December 21, 2011. Retrieved August 3, 2012. ^ a b Mangefeste, Tony (September 22, 2011). "Protecting the pre-OS environment with UEFI". Building Windows 8. Archived from the original on August 10, 2012. Retrieved October 17, 2011. ^ a b c Warren, Tom (January 16, 2012). "Windows 8 ARM devices won't have the option to switch off Secure Boot". The Verge. Retrieved August 3, 2012. ^ a b Garling, Caleb (September 23, 2011). "Windows 8 Secure Boot Sparks Linux Furor, and a Microsoft Response". Wired.com. Condé Nast. Retrieved August 3, 2012. ^ "Windows 8 and the Cloud: SkyDrive". PC Magazine. Ziff Davis Media. Retrieved September 9, 2012. ^ Case, Loyd. "Test Driving Windows 8 RTM". PC World. IDG. Retrieved September 9, 2012. ^ a b "Windows 8 review". Pocket Lint. Retrieved September 9, 2012. ^ "Facebook Connect is no longer available". Microsoft. Retrieved June 8, 2015. ^ Mauceri, Rob (March 11, 2013). "Flash in Windows 8". IEBlog. Microsoft. Retrieved March 24, 2013. ^ Hachamovitch, Dean (May 31, 2012). "Windows Release Preview: The Sixth IE10 Platform Preview". Microsoft. Retrieved June 7, 2012. ^ "Engineering Windows 8 for mobile networks". Building Windows 8. Microsoft. Retrieved October 21, 2012. ^ a b c d e Miller, Michael. "Build: More Details On Building Windows 8 Metro Apps". PC Magazine. Retrieved February 10, 2012. ^ a b Rosoff, Matt. "Here's Everything You Wanted To Know About Microsoft's Upcoming iPad Killers". Business Insider. Archived from the original on January 22, 2013. Retrieved February 10, 2012. ^ a b "Microsoft talks Windows Store features, Metro app sandboxing for Windows 8 developers". The Verge. Vox Media. Retrieved September 8, 2012. ^ "Microsoft advises developers to stop using 'Metro' name in apps following possible trademark dispute". The Verge. Vox Media. Retrieved August 3, 2012. ^ "Microsoft now using 'Modern UI Style' to refer to Windows 8 'Metro Style' apps". Retrieved August 10, 2012. ^ "Windows 8: The Metro Mess". PC Magazine. Retrieved September 8, 2012. ^ "Microsoft finally comes clean(er) on post-Metro naming plans". ZDNet. CBS Interactive. Retrieved September 13, 2012. ^ "Modern design". MSDN. Microsoft. Retrieved December 28, 2013. ^ "Windows 8 browsers: the only Metro apps to get desktop power". TechRadar. Future Publishing. Retrieved November 13, 2012. ^ "Mozilla previews 'Metro'-ized Firefox for Windows 8". Computerworld. IDG. Retrieved November 13, 2012. ^ "Developing a new experience enabled desktop browser". Microsoft. October 22, 2012. Retrieved November 15, 2012. ^ "Firefox for Windows 8 enters Aurora channel with touch and gesture support". Engadget. Retrieved September 21, 2013. ^ Nightingale, Johnathan. "Update on Metro". Firefox Future Releases Blog. Retrieved March 14, 2014. ^ "Windows Blue: a video preview of what's next for Windows 8". The Verge. Vox Media. Retrieved March 26, 2013. ^ a b "Charms: Search, share, start, devices, and settings". Microsoft Surface documentation. Microsoft. Retrieved May 21, 2013. ^ Otey, Michael. "Top 10: Windows 8 Keyboard and Mouse Survival Guide". Windows IT Pro. Penton. Retrieved May 21, 2013. ^ "Windows 8: Farewell Start button?". The New Zealand Herald. February 10, 2012. Retrieved February 10, 2012. ^ a b "A Guide to Getting Around the Windows 8 Beta With a Mouse". PC World. Retrieved September 8, 2012. ^ "RIP Aero Glass; Windows 8 Sticks a Fork in Familiar UI". PC Magazine. May 19, 2012. Retrieved May 20, 2012. ^ a b c "Windows and Windows Server Developer Preview Compatibility Cookbook". Microsoft. March 27, 2012. Retrieved October 26, 2012. ^ "Upgrade to Windows 8". Microsoft. Retrieved October 25, 2012. ^ "Windows 8 system requirements". Windows Help. Microsoft. Retrieved December 15, 2012. ^ "PAE/NX/SSE2 Support Requirement Guide for Windows 8". Retrieved June 4, 2012. ^ "What is PAE, NX, and SSE2 and why does my PC need to support them to run Windows 8?". Windows Help. Microsoft. Retrieved December 15, 2012. ^ "Introduction to Connected Standby". Microsoft. September 28, 2012. ^ "Memory Limits for Windows and Windows Server Releases". MSDN. Microsoft. Physical Memory Limits: Windows 8. ^ a b "Skylake support on Windows 7 and 8.1 given a one-year extension". Ars Technica. Condé Nast. Retrieved March 18, 2016. ^ a b "Microsoft backtracks on Windows 7 support deadline". Computerworld. IDG. Retrieved March 18, 2016. ^ Larsen, Shad (August 11, 2016). "Updates to Silicon Support Policy for Windows". Windows. Retrieved May 9, 2017. ^ a b Jo Foley, Mary (August 11, 2016). "Microsoft extends again support for Windows 7, 8.1 Skylake-based devices". Retrieved May 9, 2017. ^ "Skylake users given 18 months to upgrade to Windows 10". Ars Technica. Condé Nast. Retrieved January 16, 2016. ^ Bott, Ed. "Microsoft updates support policy: New CPUs will require Windows 10". ZDNet. CBS Interactive. Retrieved January 16, 2016. ^ Crothers, Brooke (January 17, 2012). "Microsoft lays out Window 8 tablet hardware requirements | Nanotech—The Circuits Blog—CNET News". News.cnet.com. Retrieved April 22, 2012. ^ Newman, Jared (January 27, 2012). "Windows 8 Tablet Requirements Revealed". PCWorld. Retrieved April 22, 2012. ^ a b c "New Windows 8 hardware specs hint at 7-inch tablets and a Microsoft Reader". ZDNet. Retrieved March 29, 2013. ^ "Windows 8 Hardware Certification Requirements". MSDN. Microsoft. Retrieved April 22, 2012. ^ Lee, Nicole (July 12, 2013). "Microsoft sets new hardware certification requirements for Windows 8.1". Engadget. AOL. Retrieved July 12, 2013. ^ "New Bluetooth, audio, TPM requirements coming for Windows 8 devices". ZDNet. CBS Interactive. Retrieved September 18, 2013. ^ a b c McDougall, Paul (July 3, 2012). "Microsoft Reveals Windows 8 Upgrade Price". InformationWeek. Retrieved July 4, 2012. ^ "Windows 8 Secrets, Beyond the Book: Guide to Product Editions". Supersite for Windows. Penton. Retrieved July 24, 2015. ^ a b c "Announcing the Windows 8 Editions". Microsoft. April 16, 2012. Retrieved April 17, 2012. ^ LeBlanc, Brandon (July 2, 2012). "Upgrade to Windows 8 Pro for $39.99". The Windows Blog. Microsoft. Retrieved July 29, 2012. ^ Keizer, Gregg (July 1, 2012). "Update: Microsoft confirms $15 Windows 8 upgrade". Computerworld. IDG. Retrieved July 4, 2012. ^ Thurrott, Paul (May 14, 2012). "Windows 8 Pro PC Upgrade Cost Is Just $15". Paul Thurrott's Supersite for Windows. Penton. Retrieved July 4, 2012. ^ "Acer Offering Free Windows 8 Pro Upgrades for Ultrabook Buyers". PC Magazine. Retrieved September 18, 2012. ^ "HP offering Windows 8 upgrade refund on select PCs". TechSpot. Retrieved September 18, 2012. ^ a b Bott, Ed (October 4, 2013). "Everything you need to know about your Windows 8.1 upgrade options". ZDNet. Retrieved January 26, 2015. ^ a b Moses, Asher. "Windows 8 upgrade boxes 'mislead' customers". Sydney Morning Herald. Fairfax Media. Retrieved November 29, 2012. ^ Whitney, Lance. "Windows 8 moves to BIOS-based product keys". CNET. Retrieved November 29, 2012. ^ a b "Pricing and Packaging for Windows 8.1". Blogging Windows. Microsoft. Retrieved September 18, 2013. ^ a b "Helping our hardware partners build lower cost Windows devices". Windows Experience Blog. Microsoft. Retrieved May 23, 2014. ^ "Windows 8 Pro Retail Box". Paul Thurrott's Supersite for Windows. Retrieved September 18, 2013. ^ a b Callaham, John (May 16, 2012). "Microsoft: Windows 8 32-bit can still run 16-bit apps". Neowin.net. Neowin. Retrieved December 16, 2012. ^ "Windows 8 will run 16-bit apps, says Microsoft". WinBeta. May 16, 2012. Retrieved December 16, 2012. ^ a b "32-bit and 64-bit Windows: frequently asked questions". Windows Support portal. Microsoft. Retrieved December 16, 2012. ^ "Building Windows for the ARM processor architecture". Microsoft. February 9, 2012. Retrieved February 14, 2012. ^ "Welcome to Windows 8—The Developer Preview". Microsoft. Retrieved March 11, 2012. ^ Noyes, Katherine (January 18, 2012). "Windows 8 Secure Boot: The Controversy Continues". PCWorld. IDG. Retrieved August 3, 2012. ^ Brodkin, Jon (January 16, 2012). "Microsoft mandating Secure Boot on ARM, making Linux installs difficult". Ars Technica. Condé Nast. Retrieved August 3, 2012. ^ Moody, Glyn (January 12, 2012). "Is Microsoft Blocking Linux Booting on ARM Hardware?". Computerworld. IDG. ^ "Why Microsoft should lift the possible ban on Linux booting on Windows 8 ARM devices". Computerworld. IDG. January 13, 2012. Archived from the original on May 18, 2012. Retrieved January 27, 2012. ^ Niccolai, James (January 13, 2012). "Windows 8 on ARM: You can look but you can't touch". Computerworld. IDG. Retrieved January 27, 2012. ^ "Minecraft creator attacks Microsoft's Windows 8 plan". BBC News. BBC. Retrieved October 16, 2012. ^ "Valve's Gabe Newell on the Future of Games, Wearable Computers, Windows 8 and More". All Things D. Dow Jones & Company. Retrieved October 27, 2012. ^ "Blizzard's Rob Pardo: Windows 8 is "not awesome" for the company". Neowin. Neowin, LLC. Retrieved October 27, 2012. ^ a b c d Warren, Tom. "Windows 8 review". The Verge. Vox Media. Retrieved October 26, 2012. ^ Pierce, David (August 16, 2012). "This is my next: Windows 8". The Verge. Vox Media. Retrieved March 14, 2015. ^ Cardinal, David (October 14, 2011). "Windows 8: Is Microsoft flailing?". Retrieved April 17, 2013. ^ Dvorak, John (September 15, 2011). "Microsoft Stops, Drops, and Rolls with Metro". Retrieved April 17, 2013. ^ a b Bright, Peter. "Windows, reimagined: A review of Windows 8". Ars Technica. Condé Nast. Retrieved October 26, 2012. ^ Kingsley-Hughes, Adrian (June 7, 2012). "Final thoughts on Windows 8: A design disaster". ZDNet. CBS Interactive. Retrieved November 27, 2012. ^ Crothers, Brooke (May 11, 2013). "Microsoft responds to 'extreme' Windows 8 criticism". CNET News. CBS Interactive. Retrieved May 15, 2013. ^ "American Customer Satisfaction Index: Microsoft". ^ Vormack, Lindsay (October 31, 2012). "Microsoft confirms 4 million Windows 8 upgrades over opening weekend". IT PRO. Dennis Publishing. Retrieved October 31, 2012. ^ Kingsley-Hughes, Adrian (October 30, 2012). "Microsoft's Ballmer not ready to reveal Windows 8, Surface sales". ZDNet. CBS Interactive. Retrieved October 31, 2012. ^ Crothers, Brooke (November 16, 2012). "Windows 8 sales 'well below' projections, report claims". CNET. CBS Interactive. Retrieved November 19, 2012. ^ LeBlanc, Brandon (November 27, 2012). "Windows 8—40 Million Licenses Sold". Blogging Windows. Microsoft. Retrieved November 27, 2012. ^ Albanesius, Chloe (November 29, 2012). "Windows 8 Sees 'Slow Start,' Analysts Say". PC Magazine. Ziff Davis. Retrieved December 4, 2012. ^ Wingfield, Nick (December 23, 2012). "Windows 8 Sales Disappoint in Shaky PC Market". The New York Times. The New York Times Company. Retrieved December 28, 2012. ^ Greene, Tim (January 11, 2013). "Windows 8 Update: IDC blames bad quarter for PC sales on Windows 8". Network World. IDG. Retrieved March 24, 2013. ^ Muncaster, Phil (January 23, 2013). "APAC PC shipments FALL for first time ever in 2012". The Register. Situation Publishing. Retrieved March 24, 2013. ^ Harvey, Cynthia (July 1, 2013). "Net Applications: Windows 8 Captures 5.1% Market Share". Datamation. Quinstreet. Retrieved July 8, 2013. ^ a b Lomas, Natasha (April 25, 2013). "Windows 8 Wins 7.4% Share of Global Tablet OS Market in Q1 – "Niche" Portion Still Beats Windows Phone's Smartphone Share". TechCrunch. AOL. Retrieved May 20, 2013. ^ "Windows 8 hype has hurt PC makers and distributors – Gartner". Channel Register. June 25, 2013. Retrieved June 29, 2013. ^ "HP brings back Windows 7 'by popular demand'". The Verge. Retrieved January 20, 2014. ^ "Ouch: HP brings Windows 7 'back by popular demand'". PC World. IDG. January 20, 2014. Retrieved January 20, 2014. ^ "Microsoft announces 'spring' update for Windows 8.1". The Verge. Vox Media. Retrieved February 23, 2014. ^ "Microsoft combats Chromebooks by cutting Windows licensing fees by 70 percent". The Verge. Retrieved February 23, 2014. ^ "Leaked help files reveal details on Windows 8.1 Update, and Windows 8.1 with Bing". BetaNews. Retrieved March 6, 2014. ^ "Microsoft making Windows free on devices with screens under 9 inches". The Verge. Retrieved April 2, 2014. 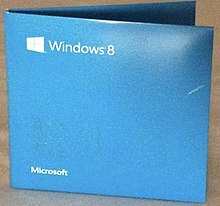 ^ "China bans use of Microsoft's Windows 8 on government computers". Reuters. Retrieved May 20, 2014. ^ "XP – the operating system that will not die". BBC News. Retrieved March 25, 2014. ^ Ramzy, Austin. "China Warns of Risks in Plan to Retire Windows XP". The New York Times. Retrieved March 24, 2014. ^ "China bans government purchases of Windows 8". PCWorld. IDG. May 20, 2014. ^ "Microsoft, China clash over Windows 8, backdoor-spying charges". CNET. CBS Interactive. Retrieved June 6, 2014. ^ "Apple, Microsoft Targets of Chinese Media in U.S. Spat". Bloomberg News. Retrieved June 6, 2014. ^ "Microsoft retaliates to China's Windows 8 spying claims". ComputerWeekly. TechTarget. Retrieved June 6, 2014. ^ Shaw, Frank X. (March 26, 2013). "Looking Back and Springing Ahead". The Official Microsoft Blog: News & Perspectives. Microsoft. Retrieved July 17, 2013. ^ "Microsoft releases Windows 8.1 Enterprise preview with VDI, Windows to Go support". PC World. Retrieved August 6, 2013. ^ Thurrott, Paul (June 26, 2013). "Download and Install the Windows 8.1 Preview". Paul Thurrott's SuperSite for Windows. Penton. ^ LeBlanc, Brandon. "Mark your calendars for Windows 8.1!". Blogging Windows. Microsoft. Retrieved August 14, 2013. ^ "Windows 8.1 update coming October 18". CNN Money. Time Warner. Retrieved August 14, 2013. ^ Anthony, Sebastian (August 27, 2013). "Microsoft confirms Windows 8.1 RTM, but expect a large bug-fixing patch on release". ExtremeTech. Ziff Davis Media. Retrieved September 2, 2013. ^ Wilhelm, Alex (February 16, 2011). "Windows 7 SP1 RTM is out for MSDN and TechNet customers". TheNextWeb.com. The Next Web. Retrieved September 2, 2013. ^ "Windows 8.1 now available on MSDN and TechNet following developer complaints". The Verge. Vox Media. Retrieved September 10, 2013. ^ "Modern Business in Mind: Windows 8.1 at TechEd 2013". Windows for your business. Microsoft. June 3, 2013. Retrieved June 3, 2013. ^ "Microsoft mandates Windows 8.1 upgrade". ComputerWorld. IDG. Retrieved November 28, 2013. ^ Singh, Manish (January 12, 2016). "Microsoft Ends Support for Windows 8 on Tuesday". Gadgets 360. Retrieved January 20, 2016. ^ "Microsoft issues 'highly unusual' Windows XP patch to prevent massive ransomware attack". The Verge. Vox Media. Retrieved May 13, 2017. ^ "Customer Guidance for WannaCrypt attacks". Microsoft. Retrieved May 13, 2017. ^ Popa, Bogdan. "Microsoft Kills Off Windows 8 App Updates Earlier than Anticipated". softpedia. Retrieved April 19, 2019. ^ "Small biz admins squawk over Windows 8.1 updates". ComputerWorld. IDG. Retrieved October 18, 2013.